The Essence Cherry Blossom Girl collection polishes were inspired by Tokyo in the summertime. Although I have not been to Tokyo, I have been to other parts of Japan in summer, and feel that these colours really capture it well! My boyfriend and I are planning a trip to Tokyo this summer, so hopefully I'll be able to get a better idea then! 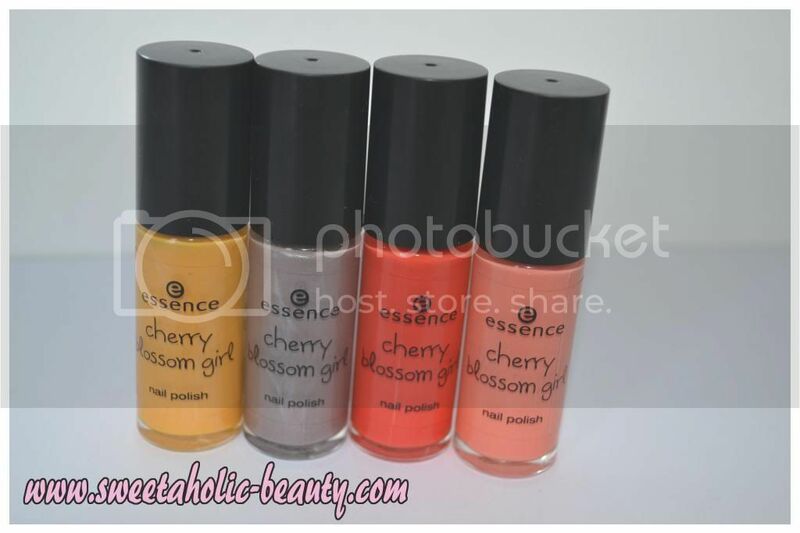 Firstly, I was surprised to see that Essence had actually named last two nail polishes, Cherry Cherry Girl and It's Peach Not Cherry the same as the two lip pencils they released in the same collection. The colours are practically identical, so I thought it was actually a nice idea! The colours, in my personal opinion, are stunning! Fortune Cookie is a truly unique colour caught between yellow and orange, and its name is an elegant fit. My Little Kimono is a gorgeous taupe shimmer polish that looks a little extra beautiful swatched than in the bottle! Cherry Cherry Girl and It's Peach Not Cherry are block colours that fit their names perfectly, and are gorgeous colours! These were swatched in direct daylight, and as you can see, the colours are lovely! I have already worn My Little Kimono, and I can tell you that the formula is wonderful! I had long-lasting coverage, as well as minimal chipping/wearing. 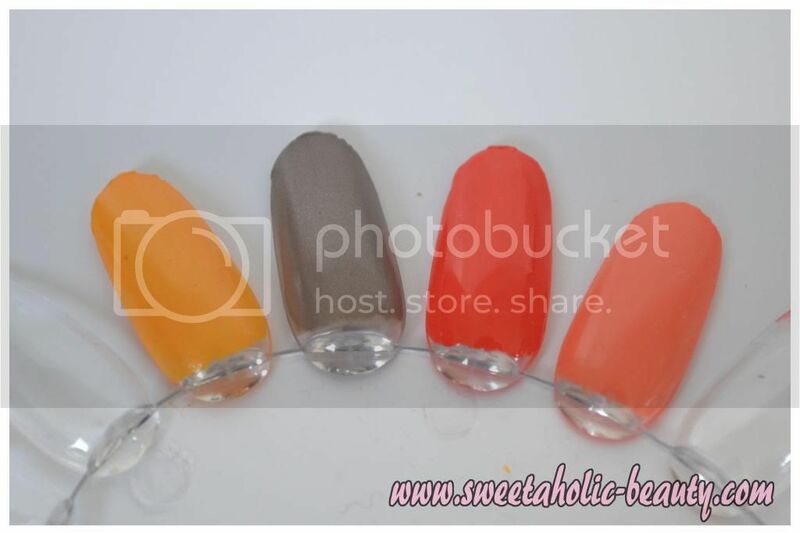 The above swatches were two coats of polish, no top coats. So you can probably see why I lusted after the collection so dearly! The collection is a really unique mix of colours, and are of good quality, like all Essence polishes I have tried. I would not hesitate the buy the entire collection again just for backups, and if I come across them, I more than likely will! These little gems retail at a phenomenal $3.50, and if you can find them, I would suggest you grab them before this limited edition collection is no more! 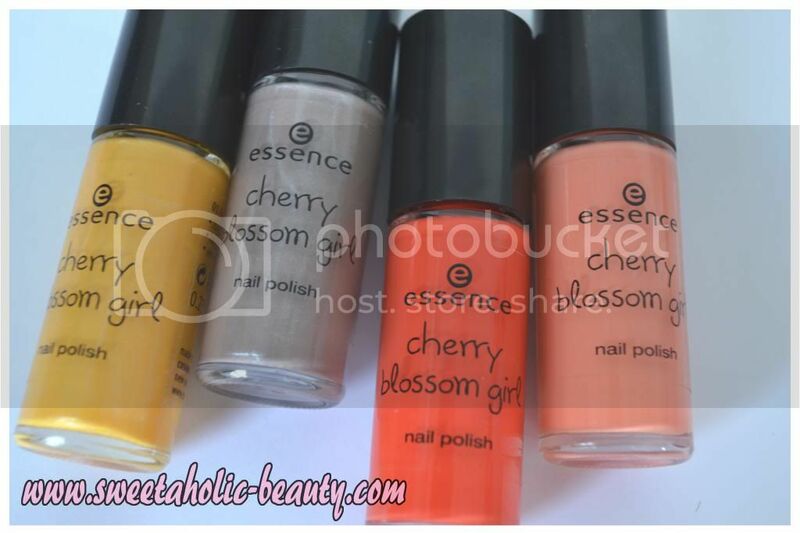 Have you tried the Essence Cherry Blossom Girl Nail Polish collection yet? If so, what did you think? Do you like the colours? These are such gorgeous colours, I love fortune cookie!! Ohhh no, you can never have enough nail polish haha! I loved the colours in this collection, you have reminded me to wear them again sometime, I haven't used them since I picked them up! oohh I want to pick them all up! Do u know if they're still available? I'm usually not too big on yellow polishes but Fortune Cookie is actually super cute!